Single parent mother with three children ages 8 months, 3 years old, and 6 years old. We will also provide a Christmas dinner for the family as well. participate. Thank you again and have a happy holiday season!!! Time: 11:00 am - 2:00 p.m. Pick up at Roosevelt H.S. 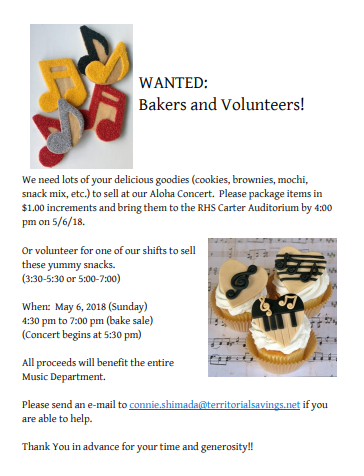 ​We are in need of volunteers and donations of baked goods for the Aloha Concert. Please see attached flyer for more information and who to contact. The 2018 Aloha Concert is right around the corner!! 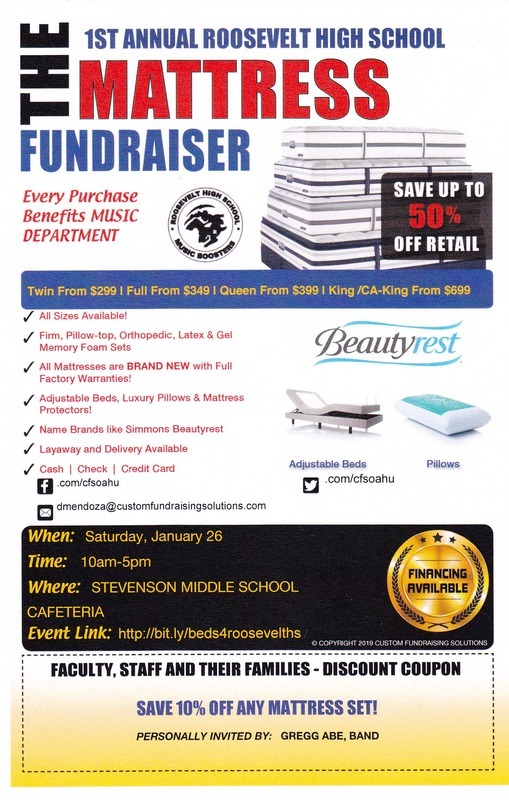 The 2018 Aloha Concert will be a fundraiser for the Roosevelt Music Department. 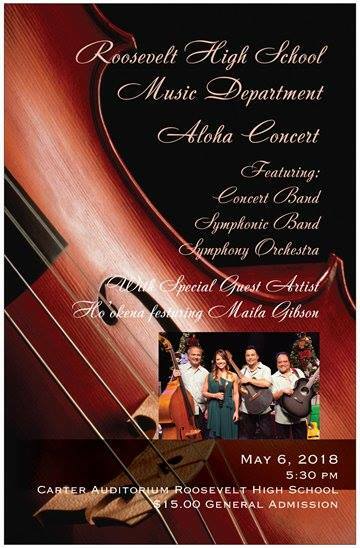 Please come and join us for a night filled with beautiful music performed by our Symphonic Orchestra and special guest, Ho'okena with Maila Gibson. 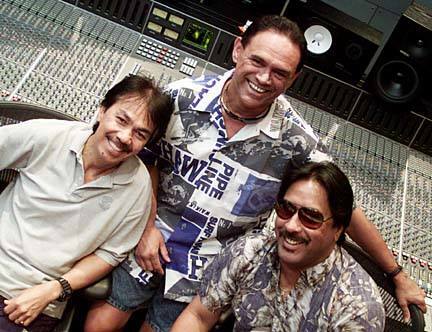 A limited number of Aloha Concert tickets will be available for purchase online for $15.00. Follow the link below to order your tickets. Tickets will also be sold at the door. Kalapana will be making a return engagement with our Symphony Orchestra at our December 10th Winter Concert. It will be a benefit concert for our music department. Ticket information will be posted soon. The Orchestra Program, the Band Programs, and the Marching Band Program could use some needed supplies for its ongoing, yearly activities. Camps, clinicians, fundraisers, and hosting other schools are "normal" parts of learning in the music education realm. 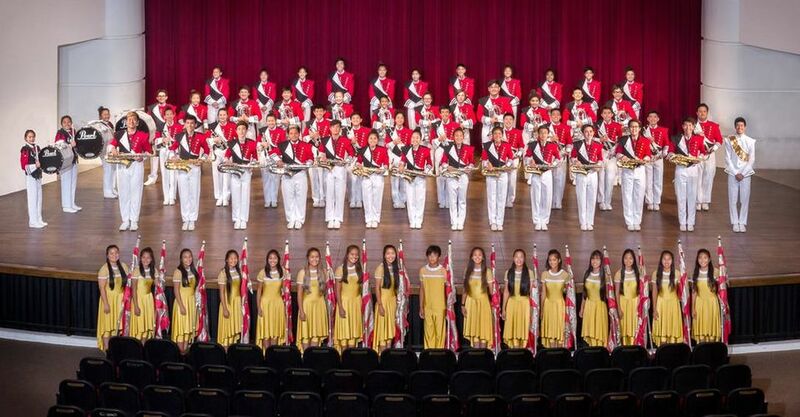 The RHS music programs boasts over 300 students total in all the programs. If you have seen the music room, not all 300 can be accommodated at once. Therefore oftentimes, we are accommodating our students outside of the music room for their lunches/refreshments or other activities. Mr. Abe and the Music Boosters have put together a "WISH LIST" of items the programs could use, instead of having to always rely and borrow from parents/families. If you are able to donate an item below, please contact Mrs. Lisa Jay <sett.ymesopua@gmail.com> (Music Booster President) or Mr. Abe @ 307-0547 to make arrangements for drop off. Thank you! Thank you to all the marching band students who participated in our Steak Plate Fundraiser! After expenses, we made a little over $3500, of which will be put to good use for our props, bus transportation to and from the tournaments, and of course a good portion of that money already went to our show and drum clinicians the students participated in June. Our sincere appreciation goes to: Taylor Tateyama & Ohana for the Styrofoam containers; Maleah Shimada & Ohana for the water, brownies, and lunch for the volunteers; KYM Catering for cooking the rice for the steak plates and for the kim chee for the volunteers; and to Pagoda Hotel for the donation of the 100 pounds of rice. Many thank yous go to all of our hard working volunteers and of course to our Booster Parents for organizing and coordinating the efforts! Special shout-out to Mrs. Shimada and Mrs. Jay for over-seeing this big project!